If you’re writing prose, the context should make clear how the words are spoken – whether they are whispered lovingly or screamed in anger. What’s more, if you’re writing prose, beware of adverbs. If you’re writing for theatre or film, it might be best to let the director and actor decide how to say your lines. This might be difficult, since after all, how the character says something shows what they want and who they are more than what they say. Also worth remembering here is the concept of idiolect, that each character in a story has a unique voice that comes across in certain idiomatic or vocal quirks, and which may be the result of that character’s background. What is the character really feeling at this point in time? Speech-Act theory says that every utterance has three meanings: 1) a plain and simple semantic meaning; 2) an effect the speaker hoped to achieve in the listener; and 3) the meaning the listener actually perceives. At best, the audience or reader should be able to understand all three, and infer the emotional state of the character speaking as well, even if the words of the speaker don’t directly convey his or her emotional state. Apropos speech acts, it is worth remembering that speaking is also an action. Hence the maxim of showing characters by what they do does not preclude acts of speech. 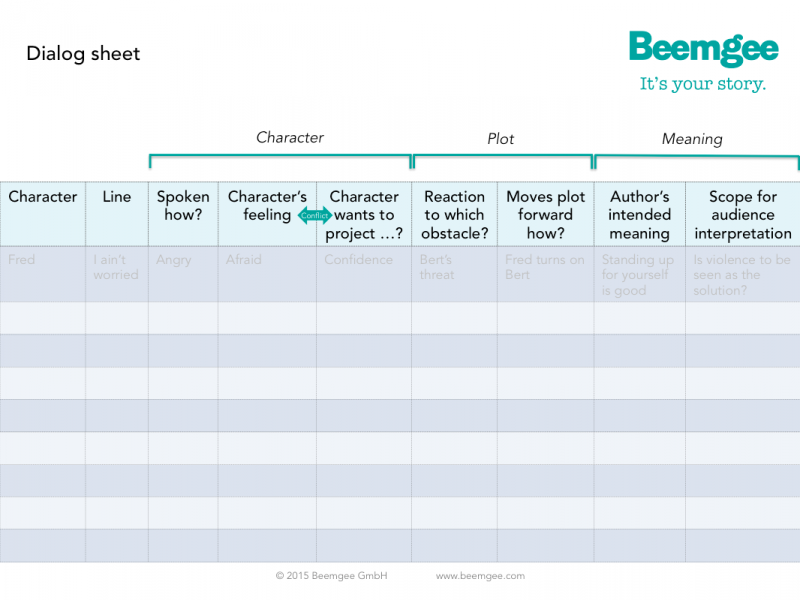 Ideally, what the character feels at any point should be at odds with what the character is trying to convey or project to his or her listener or to the world at large. The conflict between the character’s real inner emotion and the façade or image he or she is trying to maintain is a source of depth for that character. All good stories have conflict, the best ones not just between the characters, but within each main character too. Stories are about characters surmounting and overcoming obstacles. The story journey the character has set out upon is full of hindrances. If there aren’t any, the plot seems to grind to a halt. These obstacles are in conflict with the character’s interests, so it is likely that each and any line the character speaks is a reaction to a hindrance. In a dialog, i.e. a conversation with another character, that hindrance is likely to be some conflict of interest expressed by the other character’s prior line. Another difference between dialog and real conversation is the importance of reaction. In real speech between people, there is less clear referral to what was said just now. In story dialog, each character’s line tends to express a reaction to what another character just said. This might take the form of an acknowledgment, a mood change, a denial, a conflict of some sort. Lines of dialog can become markers of the beats within a scene. Dialog comprises words, or speech. And as we noted earlier, speech is as much an act (or action) as any other. It marks what a character does, and it has an effect on those who listen to it. This effect causes a reaction. So a line of dialog in some small way moves the plot forward, in that it has its raison d’être when it is an action in itself and creates a reaction. Next to showing us, the audience or reader, what this character is like and shunting the plot along, good dialog also conveys meaning beyond its narrative function within the story. In commercial or pulp stories, this consideration may arguably not be so important. But usually any author has something to say by writing a story. That “something”, let’s call it the author’s intention, is one level of meaning. By choosing to have the character say this particular line in just such a way, the author is in some small way trying to persuade the audience or reader to feel or think a certain way. So an author might ask him or herself, is each and every line consistent with or an expression of my theme? Lastly, the audience or reader has a mind of his or her own. The meaning of any work, any text, any line is created by the interpretation – conscious or otherwise – each and every recipient brings to it. Meaning is not just what the author wants the work or line to mean, meaning is what the recipient makes of it. So it may be advisable for an author to step back and consider what interpretations are possible. Sometimes an audience understands something completely different from what the author thinks the characters said.